Jewish Lights Publishing, 9781580233064, 304pp. "Ancient traditions, whose only claim to authenticity is that they are old, run the risk of becoming old-fashioned. But if an ancient tradition can claim to be not only ancient but also timeless and contemporary, it has a far greater chance of convincing each new, young generation of its value. Such a claim requires that each generation's retelling use the new metaphors of the new generation." In our era, we often feel that we can either speak about God or think scientifically about the world, but never both at the same time. But what if we reconciled the two? How could the basic scientific truths of how the natural world came to be shape our understanding of our own spiritual search for meaning? 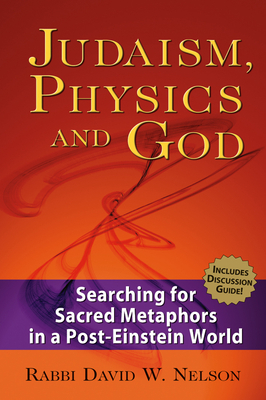 In this provocative fusion of religion and science, Rabbi David Nelson examines the great theories of modern physics to find new ways for contemporary people to express their spiritual beliefs and thoughts. Nelson explores cosmology, quantum mechanics, chaos theory, relativity and string theory in clear, non-technical terms and recasts the traditional views of our ancestors in language that can be understood in a world in which space flight, atom-smashing and black holes are common features of our metaphorical landscape. Judaism, Physics and God reframes Judaism so that it is in harmony with the conquests of modern scientific thinking, and introduces fascinating new ways to understand your relationship with God in context of some of the most exciting scientific ideas of the contemporary world.